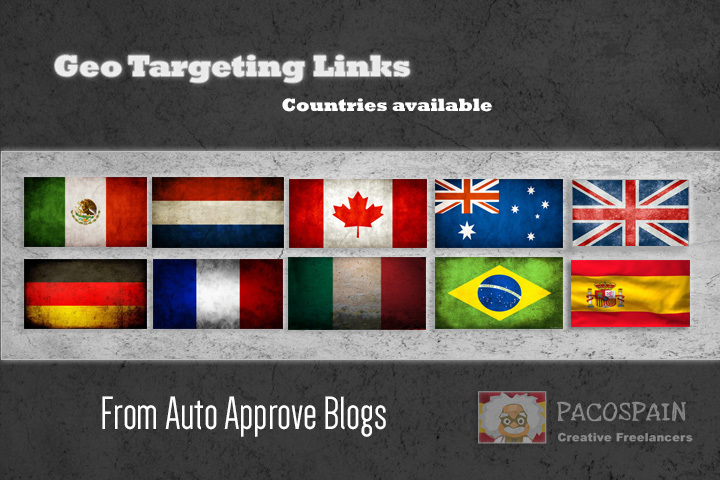 create backlinks, exclusively on country specific domains - 10 countries available. This service is for GEO TARGETING signals to Google. We will build backlinks, exclusively on country specific domains (auto approve WordPress blogs) to increase your serps in Google. What is Country TLD of Referring Domain? : Getting backlinks from country-specific top level domain extensions (.de, .cn, .co.uk) helps you rank better in that country. This service is to increase the number of country specific domains pointing to your site! EACH ORDER is for 1 country and 1 url, we scrape always as much as possible, in rare cases you get less then we state, this is possible but like said is very rare that happens normally you get more. Amount of backlinks depends on your niche, we always try to over deliver, ONLY THING WE ASK is to leave us a review! create backlinks, exclusively on country specific domains - 10 countries available. is ranked 5 out of 5. Based on 7 user reviews.